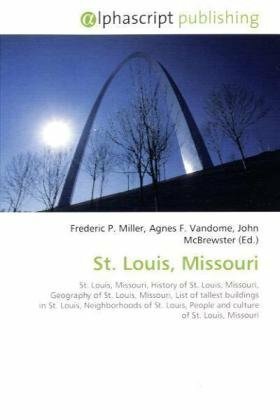 As the oldest European settlement in Missouri, Ste. 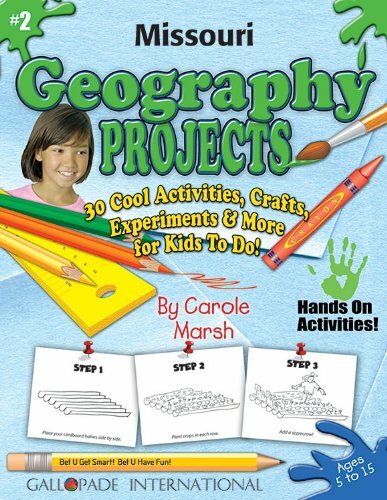 Genevieve was the funnel through which the eastern Ozarks (the 5,000 square miles beyond Ste. Genevieve’s location on the Mississippi) was established. 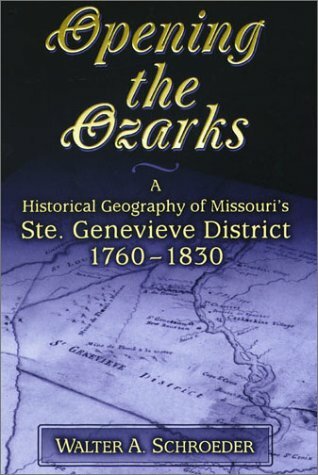 A magisterial account of the settlement of this area from 1760 through 1830, Opening the Ozarks focuses on the acquisition and occupation of land, the transformation of the environment, the creation of cohesive settlements, and the building of neighborhoods and eventually organized counties. The study begins with the French Creole settlement at Old Ste. Genevieve in the middle of the eighteenth century. 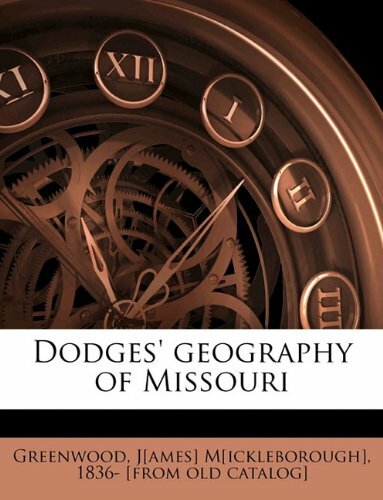 It describes the movement of the French into the Ozark hills during the rest of that century and continues with that of the American immigrants into Upper Louisiana after 1796, ending with the Americanization of the district after the Louisiana Purchase. Walter Schroeder examines the cultural transition from a French society, operating under a Spanish administration, to an American society in which French, Indians, and Africans formed minorities. Schroeder used thousands of French- and Spanish-language documents, including the Archives of the Indies in Seville, Spain, as well as documents from Ste. Genevieve and St. Louis to gather his information. He also utilized thousands of land records from the American period, including deeds of land sales and sales from the public domain, and plats from both the Spanish and American periods. In addition, Schroeder performed years of fieldwork and perused aerial photography of the area, interviewing residents and searching for vestiges of the past in the landscape. 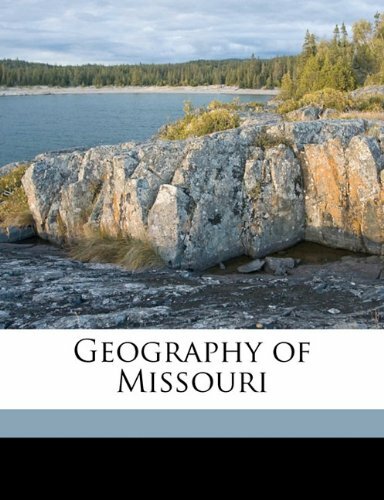 As the only study to deal with the cradle of Missouri and the first trans-Mississippi expansion of the Anglo-American frontier, Opening the Ozarks will be invaluable to anyone interested in America’s geographical history, particularly that of Missouri. 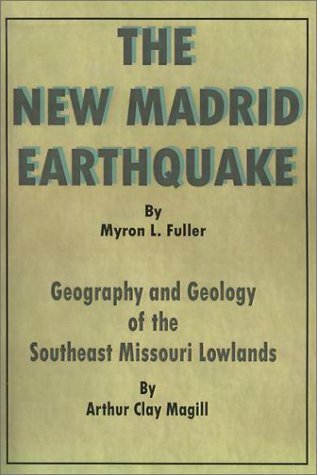 The New Madrid Earthquake was among the great earthquakes of known history, affecting the topography more than any other earthquake on the North American continent. Judging from their effects, they were of a magnitude of 8.0 or higher on the Richter Scale. They were felt over the entire United States outside of the Pacific coast. Large areas sank into the earth, new lakes were formed, the course of the Mississippi River was changed, and forests were destroyed over an area of 150,000 acres. Many houses at New Madrid were thrown down. "Houses, gardens, and fields were swallowed up" one source notes. But fatalities and damage were low, because the area was sparsely settled then. Survivors reported that the earthquake caused cracks to open in the earth’s surface, the ground to roll invisible waves, and large areas of land to sink or rise. The crew of the New Orleans (the first steamboat on the Mississippi, which was on her maiden voyage) reported mooring to an island only to awake in the morning and find that he island had disappeared below the waters of the Mississippi River. Damage was reported as far away as Charleston, South Carolina, and Washington, D.C. The Atlas of Lewis and Clark in Missouri is a splendid re-creation of the natural landscape in the days when a vast western frontier was about to be explored. 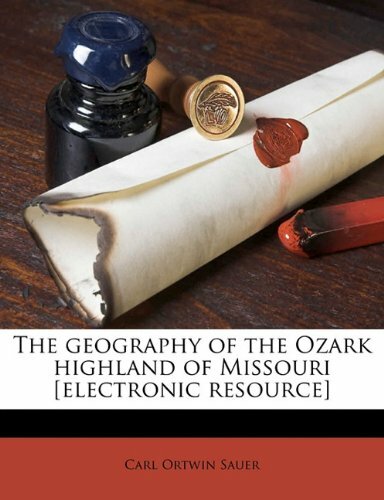 The Corps of Discovery's expedition began in territorial Missouri, and this book of impecable computer-generated maps opens an extraordinary window onto the rivers, land, and settlement patterns of the period. 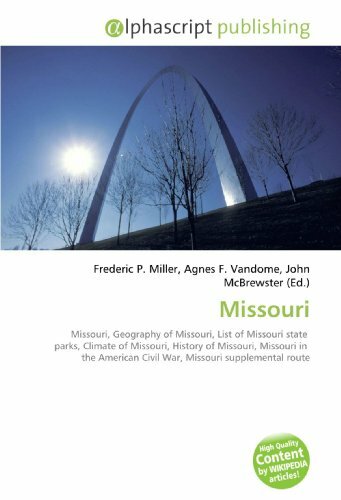 This book is an intensive examination of the Missouri portion of the expedition through a series of twenty-seven maps developed by combining early-nineteenth-century U.S. General Land Office (GLO) survey documents with narratives of the trip derived from expedition journals. Not a "Big Dissapointment" at all! 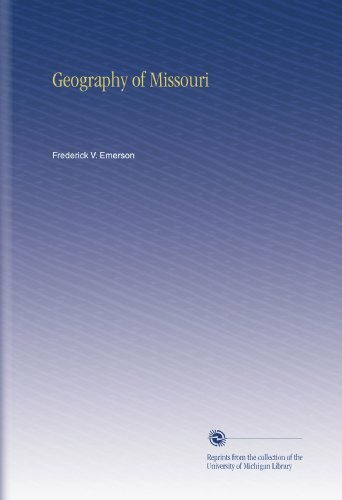 This book was exactly what it advertised itself as: an ATLAS of Lewis & Clark's journey through what is now the state of Missouri.The authors Harlan and Denny painstakingly researched and reconstructed the channel of the Missouri River and vegetative cover based on expedition field notes and those of the government township survey of 1816. There were no such government surveys of Kansas, Iowa, Nebraska, etc. until decades later. By then, the Missouri River had already altered course extensively from what it had been in Lewis and Clark's time.This explains in part, why this edition was concerned only with the state of Missouri. Without traveling back in time, this book gives you as close a picture of the landscape as is probably possible. As an Atlas, it naturally relies far more on maps than text to show landmarks noted by the expedition, and where they camped. 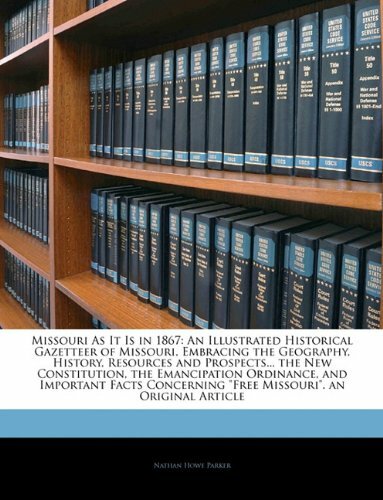 It is actually an excellent companion piece when reading the original journals as transcribed by Moulton or even the Biddle edition of 1814.Ample information is provided to follow the progress of the Corps of Discovery from St. Louis to the Iowa line. Especially if you live near or are familiar with the Missouri valley of today. it is interesting to contrast and compare what you see today to what it was like back then. For aficionados of Lewis & Clark or westward exploration, this is an attractive, very well written, easy to follow Atlas. In the spring of 2001, National Geographic Magazine editor Bill Allen was shown a map of the historic Missouri River of Lewis & Clark created by University of Missouri geographer and cartographer James D. Harlan. 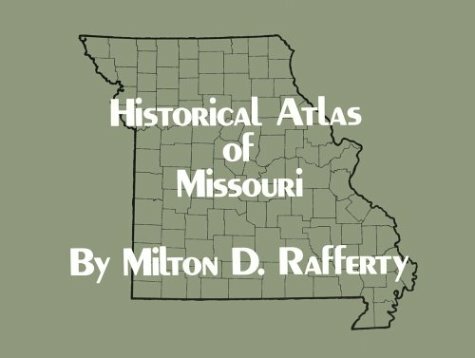 It was immediately recognized it as a one-of-a-kind historical gem.In the April 2002 issue of National Geographic, the magazine featured Harlan's extraordinary maps recreating the natural landscape along the Missouri River as seen by the Corps of Discovery on their outward and home bound journeys in 1804 and 1806. It was my priviledge to write the NGM article. I've watched Harlan and historian James Denny at work in the field and cannot underscore enough the enormity and significance of what they have accomplished with their monumental work-- Atlas of Lewis and Clark in Missouri.It includes 27 detailed computer-generated maps developed from early 19th-century survey documents that digitally replace today's Missouri River with the historic river as it was when the explorers passed through territorial Missouri. The maps depict the course of the Corps of Discovery, precisely locating their campsites and stopping points, as well as landscape features noted by the explorers in their journals.Profound changes in the Missouri River's course over the past 200 years due to flooding, earthquakes,meandering and alterations by the Corps of Engineers to improve navigation have rendered it impossible until now to accurately match the descriptions in the explorers' journals with locations along today's river. Harlan and Denny's atlas with its richly researched and beautifully written accompanying 70,000 word essay provides readers with an extraordinary window on a landscape thought until now to be lost. 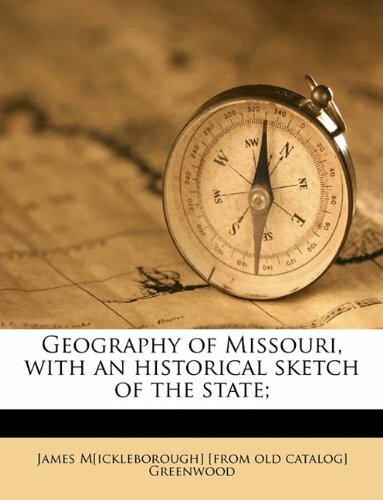 Little has been written about the work ofsurveyors who mapped the Missouri between 1815-1819 between St. Louis and Kansas City, a decade after the return of the Corps of Discovery.Using21st century computer technology, Harlan has brought their detailed landscape observations collected in handwritten field notebooks alive again.The result is a collection of beautifully presented and historically accurate maps that match up precisely with Lewis & Clark's journal entries. Authors Harlan and Denny know the landscapes they present in their atlas firsthand.Lewis and Clark scholars and affectionadosacross the country have sung their praises from the moment the maps and atlas were released.Both are in high demand across the state and beyond its borders.This is an atlas to be read, savored, and revisited by Missourians and anyone else in love with exploration.This labor of love and talent is as close as one could hope to ever get to experiencing the Missouri River as the Corps of Discovery did 200 years ago. Bravo Harlan and Denny for giving us back the lost Missouri River of Lewis and Clark! 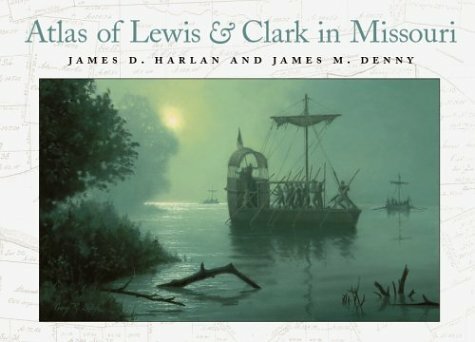 This monumental book by James D. Harlan and James M. Denny is a remarkable feat of cartographic reproduction of the journey of Lewis and Clark up the Mississippi from the mouth of the Ohio River to the mouth of the Missouri River and then up the Missouri River to the Nebraska/Iowa border in 1803 and 1804, followed by a commentary on the return journey through Missouri in 1806 in addition to four map plates illustrating the historical land cover of the Missouri River valley in what is now the State of Missouri.The creation of these maps by James D. Harlan represents a painstakingly detailed analysis of original survey maps of the river cross referenced to Lewis and Clark journal entries to create as close a representation of the Missouri River as it passes through what is now the State of Missouri in the time of Lewis and Clark as is likely to ever be achieved.The beautifully reproduced map plates are accompanied by a thorougly researched and spledidly written text providing a highly readable, clear and coherent description of the journey through Missouri by James M. Denny.In my estimation this book will be the book all past as well as future attempts to describe and cartographically render any portions of the Lewis and Clark journey will be measured by.The authors, as well as the University of Missouri Press are to be commended for this amazing book.